Bakersfield College returning students Junio Menchaca and Jennifer Crissman reflect on the panel presentation after the book discussion that too place Nov. 13 in a Business-building classroom. 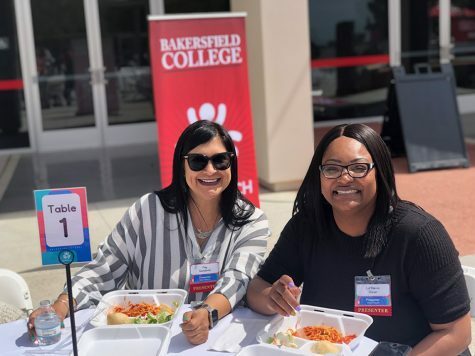 Bakersfield College administration and faculty have come together to create a multiple-part book discussion that focuses on Bailey, Jaguars, and Jenkins’ book, Redesigning America’s Community Colleges: A Clearer Path to Student Success. The book discussions were divided into six separate panels, each focusing on a different chapter from the book, in order to sit down and discuss each chapter separately to get a better idea of how BC can increase student success rates. On Nov.13, a panel of faculty, administration, and students discussed chapter four of the book during the book discussion that took place at a Business-building classroom. Panelists included academic development chair Dr. Kimberly Bligh, interim dean of instruction Cornelio Rodriguez, BC assistant football coach Reggie Bolton, and students Junior Menchaca and Jennifer Crissman. During the discussion, the panel focused on helping underprepared students, speaking of personal experiences as faculty working with these students, as well as hearing student perspectives on the pros and cons of having accelerated courses at the BC campus. Menchaca spoke about his experience after returning to BC and the importance of accelerated courses. 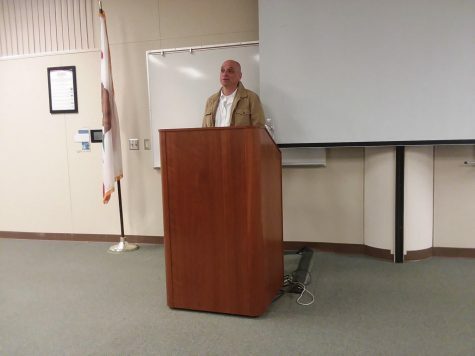 “When I went through the program, it showed me that all these things…just needed to be refreshed…a lot of it is just a refresher, and that’s why I think accelerated programs are so important,” Menchaca said. Currently BC offers accelerated math and reading/writing courses, which are meant to compress and merge courses. The usual 16-week course is reduced to eight weeks and merges classes to where the first eight weeks of instruction students focus on one course, and the last eight weeks focus on the next required course. These accelerated courses make it possible for students to complete what would usually take two semesters and condenses it into one. BC has had discussions on different chapters of the book throughout the fall semester. Bligh stated that BC president Sonya Christian wanted to have panel discussions where faculty, administrators, and students would come together to discuss how faculty could improve and get an idea of what was going on in the classrooms. BC mathematics learning center faculty member Rachel Vickrey also expressed the importance of coming together as faculty. “I think it’s really valuable for faculty and administrators. When we read books together and talk about these books and reflect on our experience, that is very valuable,” said Vickrey. The book discussions chapter panels have concluded, but student panels and further discussions are scheduled throughout the remainder of the semester. Check out the BC website for further information.